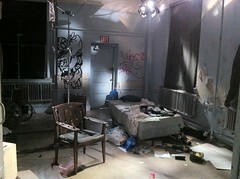 Daniel Maurer A “hot set” inside of the former M.H.C. school. In another room remodeled to resemble a grimy bedroom, a mattress sagged in the corner, fake blood spotted the ground, and graffiti covered the walls. Unlike the religious murals by Chico and other artists throughout the school building’s hallways, the tags reading “Make $” were commissioned for the film. Ms. Reynolds said there was little evidence of actual squatters or vandals when the location was scouted. 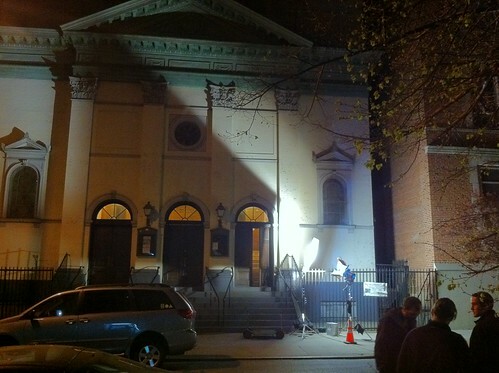 Outside on East 12th Street, cameras rolled as a taxi cab pulled up to the church. Out stepped Mr. Cusick, perhaps best known for his role as Desmond on “Lost” and currently starring in ABC’s “Scandal.” Filming was expected to go till 3 a.m. or later. Ms. Reynolds resides in the small town of Leland, Mich. with her husband and co-producer, James Carpenter, but early this morning she had a short commute home: during the shoot, she’s staying at a friend’s apartment in Stuyvesant Town, just a few blocks north. An earlier version of this post misidentified Ross Satterwhite, the executive producer of the film, as Ms. Reynolds’s husband. Her husband is James Carpenter, also a producer.